Its that time of year where the days of summer are fading like the light of the sun in the cool evening breeze (and if you’re in LA, you only got about a week of real heat this summer). We have to open our doors to Fall and all the fun it brings, including the new Fall fashions. In looking for some great Fall finds, I have been very impressed with the major attention that has been recently paid to the styling of the Sofft collection. They have really up’ed the style factor making my venture to find comfortable stylish shoes find a Mecca. 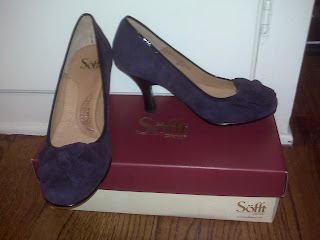 These delicious ‘Fiorella’ dark purple suede pumps by Sofft made me melt in them when I tried them on at the Nordstrom’s Anniversary Sale. I fell in love with the vintage modern Anthropologie-like vibe they give off. Those are really cute! 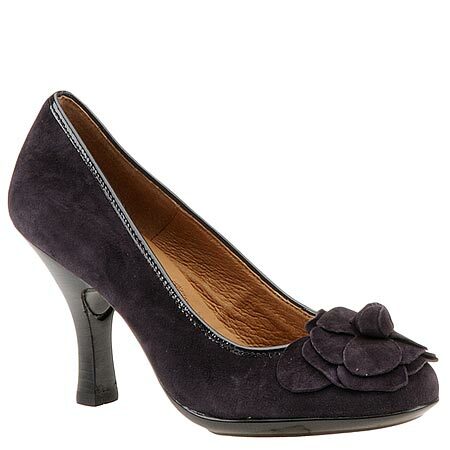 A lot of shoes have that rose/ruffle on the toe. OMG! Those first black ones with the flower are SO cute! Want them now! Thanks for sharing this :) I am your newest follower! Come by when you can to check out my blog, looking forward to reading more of your blog! Hey Gal! cute shoes, but I couldn't wear them if my life depended on it. I have REALLY bad feet problems and the only shoes that come close to fitting right are SAS shoes. Not very pretty, but when you get my age, it becomes more "comfort" and less looks. I just wanted to let you know that I'm following your blog, and I tried to follow you on BF, but your little "follow" thing underneath your picture is missing. I am also following you on Twitter. @Marci: You are *most* welcome! But no thanks are necessary, as I'm happy helping you and anyone who reads my blog out. ;) I'm very grateful for your follow! @PJ: Thanks for bringing that issue to my attention, I'm going to work on that so it can be fixed. I'm sorry to hear about your feet problems. :( I would imagine that would shift my shoe closet emphasis greatly. HOWEVER, I do have a number of flats I have featured in the past. A couple of my fav are The Ultimate City Flat for the Ultimate CIty Girl and the Aldo flats. ;) I hope that you find some shoes here worth your while and serve your needs. xoxo lovies! 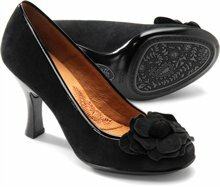 Love, love, love the black on black suede flower shoe!!! Thanks Kathy! I hope they become the newest addition to your Shoe Closet! xoxo. Love your blog-- and your style:) Sofft shoes are some of my favorites, and they even make them in sizes to fit my extra wide foot... plus they are so comfortable. I buy a lot of my shoes from 6pm.com, which carries Sofft and lots of other good brands at great discounts, FYI.